Sugar & Spice Children's Market: A drum roll please! The other exciting news for the market is that there will be 100 goodie bags to giveaway at every market and even better, I will not have to pack them YAY!! The Goodie Bag exchange is a new business that offers affordable advertising for mumprenuers. If you are thinking about how to spread the word about your business but your budget is on the modest side, then you should seriously consider The Goodie bag exchange. They distribute goodie bags through out Australia but you also have the option to select which bags your material appears in .... retailers with Sugar & Spice will be able to place material in our bags at a discounted rate. Did you get a copy of our gorgeous new newsletter yesterday? I have received such positive feedback but I can not take all of the glory for the newsletter, Prue from Gigi & Lulu made it pretty and the contributions from Nat (tiny & Little), Jo (Little Melbourne - or Little Melby as I like to call it now!! ), Jem (Little Eats) and Sabrina (Little Kitchen) were so incredibly awesome!! And you will be seeing more of their fabulous work in the future! Make sure you spread the love by forwarding the newsletter to your friends and gain yourselves an entry for our awesome Chrissy giveaway for each person you forward the newsletter to! 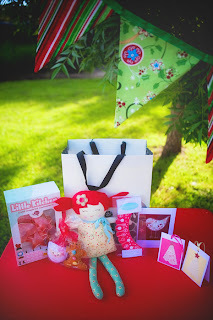 How gorgeous is this photo of just some of the chrissy goodies to win by Kim Selby? I wish all market organisers were as organised as your are with 2011 dates - makes it much easier for those of us travelling! Off to pencil in some more dates for next year, yay! I typed how to put a calendar on blogger. Thanks for the dates, I want to apply for my first Sugar and Spice market. Music to my ears Anna!!! The market this morning was fantastic. I only heard about it at the last minute and was so pleased that I went. Every stall had gorgeous goods and I could have spent hundreds! Actually, I did spend a bit! Anyway, I have blogged about your market but noticed a discrepancy between dates for when the next Ballarat one is. On your post above you say 13th Feb but on the flier I picked up from the market it says 27th Feb. Please confirm so I can visit again! Oh, and see abodeandabroad.blogspot.com for my own little promo for the market!